Is the Coup Against Corbyn a Plot to Spare Tony Blair from War Crimes Probe? The Skinner line is that the coup was timed to avoid Corbyn calling for Blair’s head next Wednesday from the Despatch Box. Indeed many would say that when Corbyn stated that he would be prepared to see a former Labour Prime Minister tried for War Crimes then he sealed his fate as leader of the Parliamentary Labour Party. 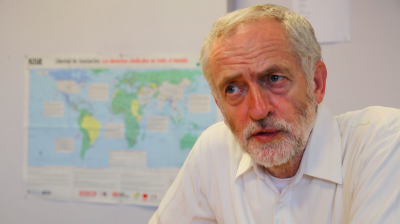 As Common Dreams reported last summer, Corbyn campaigned on the position that the former prime minister could face war crimes charges based on his decision to partner with then-U.S. President George W. Bush in the invasion of Iraq. And just over a month ago, the Labour leader reiterated his willingness to have Blair tried for war crimes after the Chilcot Report is released. Observers have pointed out that Eagle also opposed the government’s investigation into the Iraq War. “So I’m wondering if this was a pre-emptive strike against the Chilcot Report, because Jeremy Corbyn has indicated he would support Tony Blair being held to account, as he should be,” Salmond said. “Certainly I’ve never seen anything like it in a parliamentary party,” the former First Minister added. But has Labour’s gambit to protect the warmongering Blair been successful? Indeed, the Independent reported Sunday that if Blair escapes censure after the report is released, some British MPs are hoping to impeach the former prime minister using an ancient Parliamentary law that could see Blair finally sent to prison for his role in the conflict.